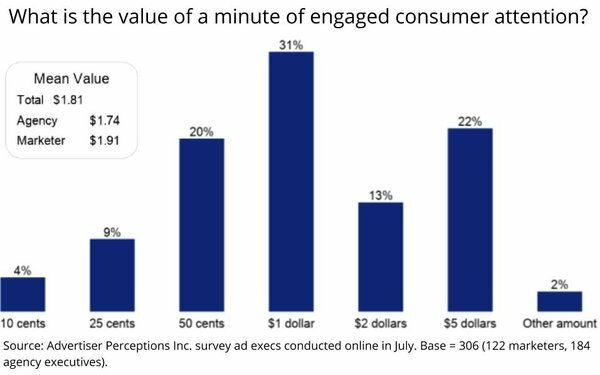 At a time when so-called “rewarded, opt-in” advertising models are gaining steam on Madison Avenue, MediaPost asked Advertiser Perceptions to poll a representative sample of advertisers and agency executives on what they consider the per-minute value of engaged consumer attention is worth. Turns out, it’s a median of $1.81, but marketers averaged about 10% more -- or a median of 17 cents more per engaged minute -- than agency executives. Many of the “rewarded,” “opt-in” or other incentivized models being explored don’t necessarily offer consumers cash for completing an engagement with a brand’s advertising. The dollar valuations serve as a baseline for understanding the economics of what could be a new model for value exchange in the advertising world. 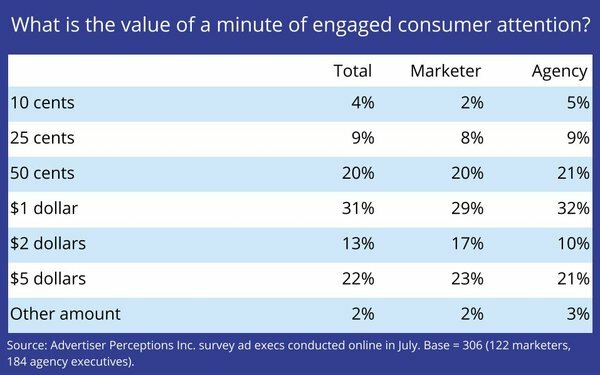 7 comments about "What's The Value Of An Engaged Consumer Minute? Turns Out It's $1.81". Marcelo Salup from Iffective LLC, July 30, 2018 at 10:44 a.m.
For a moment I took this half seriously. With a sample of 300 people AND no hard guidelines as to how anyone in the survey determined "value" other than for a very narrowly-defined universe, this is just cocktail party fodder. Ed Papazian from Media Dynamics Inc, July 30, 2018 at 10:52 a.m.
Joe, it's interesting to compare these findings---or estimates----with the typical experience of a TV advertisers who pays about 3 cents per "viewer" per minute. Of course about half the time the "viewer" is not even in the room or is not paying attention---so make that 6 cents. And, to be fair, even when "watching" a 60-second commercial, attentiveness wavers from second to second---so make that 9 cents per viewer. Ah---then there's the question of whether the viewer is even interested. Let' s say that only 20% of them are---for a typical advertiser. That raises the cost of a typical, broad based TV buy--- including lots of people who aren't really interested---to about 45 cents, per viewer---or a lot less than the projected $1.81 for "Reward Opt-In" viewers. Finally, there is the question of reach. With a poorly targeted mass audience buy on TV you eventually---like in a month---reach about 65-70% of your total target group and still more over a longer interval. How does that compare with "Reward Opt-In"? Joe Mandese from MediaPost, July 30, 2018 at 12:16 p.m.
@ Marcelo Salup: You are welcome to take it anyway you want -- seriously, half-seriously, or flippantly. The research and the findings are what they are. The sample is not a general market, consumer survey, but is part of an ongoing panel of high-level industry executives managed by Advertiser Perceptions. We have been working with them and reporting on various findings of research conducted by them for about a decade. Some of our readers have taken them seriously. Joe Mandese from MediaPost replied, July 30, 2018 at 12:22 p.m.
@ Ed: Mass market reach is not the only criteria marketers utilize when engaging consumers. I don't believe the rewarded opt-in model has been utilized on mass market TV, though forms of it have been tried for years in various interactive test-beds, addressable TV, etc. Ed Papazian from Media Dynamics Inc, July 30, 2018 at 12:42 p.m.
Joe my point is that even if you are targeting an ultra small and selective target group---like left -handed people aged 18-22.5 who like spicey katsup as part of their tuna salad----you still need mass reach of that particular group or you may be whistling "Dixie" with over reliance on any form of "Opt-In" program. The Opt-in" idea is fine but only if you get a significant number of targeted people to do so and the cost is reasonable. Joe Mandese from MediaPost replied, July 30, 2018 at 12:48 p.m.
Ed: Almost all forms of advertising, marketing and media communications require an opt-in at some point. Take TV, for example: consumers always have the option of leaving the room, turning the channel, turning their head of simply ignoring it. Rewarded, opt-in models require the consumer to complete an ad engagement explicitly. Usually, they are done in digital media environments where that can be controlled. I don't think that's something that can be done on conventional linear TV, so it's impossible to compare that form of rewarded, opt-in engagement model. It requires that the consumer do something first -- complete an ad or some other brand engagement -- in order to receive the reward. Ed Papazian from Media Dynamics Inc, July 30, 2018 at 12:59 p.m.
Joe, I agree that one way or another people "opt-in" to ads or they don't. All I'm saying is that any advertiser with a specific target audience---no matter how defined---should be concerned with how many of those targeted people "opt-in". In a "rewards" program, this process is stimulted by the reward so, naturally, an unknown number of people will "opt-in" and, presumably will be more engaged by the ad pitch. But how many?----- is my point. With TV and other traditional media, you are resonably assured of reaching most of any group you define at a certain fairly low cost. What percentage of the average "Opt-In Rewards" target group actually opts-in? Is it 2%, or 5% or 25%? The answer would weigh heavily in my decision whether to go this route. I'm not opposed, but am simply posing a question, relative to costs---that most advertiser CMOs should be asking.